Athol Marley caught this enormous short-tailed stingray fishing with rod and reel from the breakwater in Lyttelton Harbour, near Christchurch. It weighed in at 36 kg. 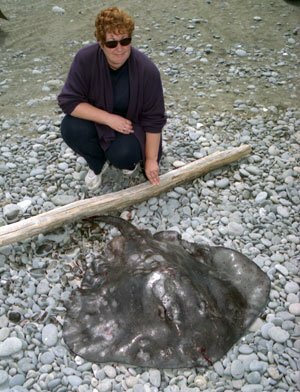 There are two species of stingray found in New Zealand; the short-tailed stingray (shown here in the picture), and the long-tailed stingray – Dasyatis thetidis. The short-tailed stingray can measure as much as 2m across and weigh 250kg, however much larger specimens have been reported measuring 3m across. The long-tailed stingray can be over 4m long but only because the tail is longer than the body. The long-tailed stingray has a smaller body and a more pointed snout. The long-tailed stingray is only rarely found south of Cook Strait. 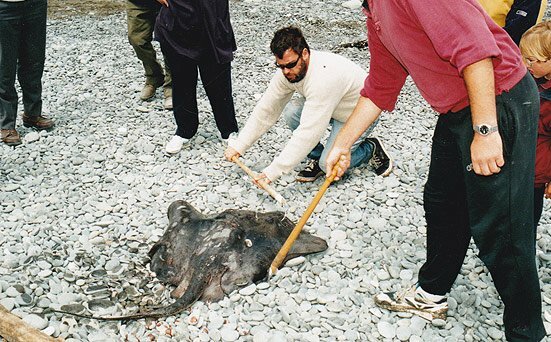 Stingrays are found mostly around northern New Zealand but the late David H. Graham reported them as being plentiful around Otago. 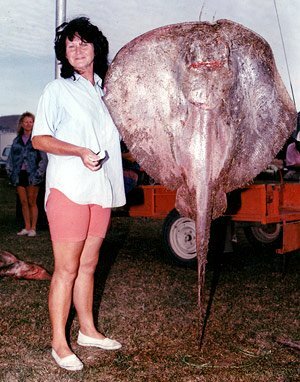 They are usually found in harbours and estuaries off beaches quite close to shore in water less than 100m deep. A crowd of onlookers gathers around a stingray caught during a surfcasting competition at Nape Nape Beach, North Canterbury. They are potentially very dangerous to swimmers as their flailing tail can inflict horrific wounds and even death. 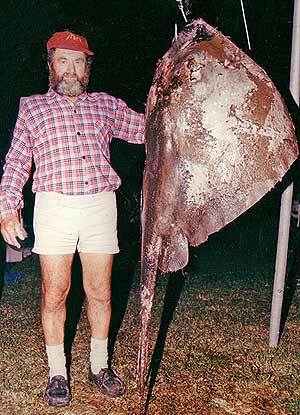 In an incident that occurred in Thames in 1938 a swimmer died after being stabbed through the heart by a big stingray. Around the world, there have been many such reports over the years. Like sharks and skates, stingrays have skeletons that are made of cartilage instead of bones. They eat shellfish and crustaceans like crabs and lobsters. Anna Valentine with a 37kg stingray taken off Lyttelton. Stingray taken while fishing at Nape Nape Beach, North Canterbury, during a surfcasting contest. Killer whales (orca) prey upon stingrays which are thought to make up a significant part of this marine mammals diet. Orca come right in close to shore in shallow bays around parts of New Zealand to forage for stingrays in what is most probably a learned behaviour passed down from older members of the pod. However, this food source is not without its hazards as killer whales have been found dead with the tail spines of stingrays embedded in their bodies! So if you catch a stingray it is best to stay away from the tail. 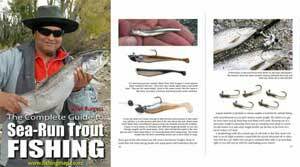 When caught while surfcasting stingrays can put up a long and determined fight. The will swim for a time and then sit hard on the bottom where they can be difficult to dislodge. It is not unusual to lose a stingray after fighting it for a long time.